Human Connections was conceived and made in response to exhibits in the Natural History Museum in South Kensington as part of the group show of the same name. The group of seven artists worked with children and young adults within the museum while each making his or her own art. The three exhibits that acted as inspiration were: first the fossil collection; second extinct species of animals and birds, third the development of Homo Sapiens. The sculpture imagines humans as an extinct species due to our own over-production, pollution and addiction to war. I pictured the finder of this long buried and fossilised human as an archaeologist from a distant galaxy in some future millennium. Human Connections was not the largest sculpture I made but it was the most difficult to store and preserve. The cement figure is life sized and prone. 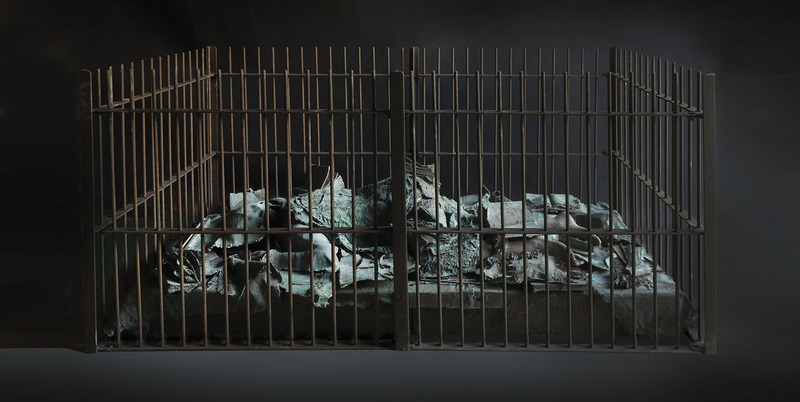 She is entombed in bronze plates and surrounded by steel railings. The reason why the victim-figure is female is a remark made by a doctor, that women are more susceptible to toxic fumes than men. The plinth on which she lies is built of timber and plywood, the latter cased in galvanised steel sheet. All metal surfaces are corroded as though recently excavated. Two bronze masks stand either side of the main piece. Each is displayed in a museum pattern glass case set on a narrow plinth the same height as the central plinth and clad in corroded galvanised steel. The installation was constructed between 1988 and 1990 for the Still and Silent Objects exhibition in the Natural History Museum, South Kensington, December 1990 to February 1991. This included the work of seven artists who came together for an exhibition in the Pitt Rivers Museum, Oxford in 1988 under the title Gathering Rites Group. The Natural History Museum arranged transport for Human Connections in its dismantled state and it took me two days work to assemble it in the large Victorian gallery. The Museum staff were helpful and kind to us but confused because responsibility for our exhibition was passed from one official to another ending up with a young woman, Jaqui Steart, who I knew as a student when I was teaching at Chelsea School of Art. Despite her last minute transfer, her arrangements for transport and access to the gallery were most efficient. Her (and our) task was not made easier when a blizzard struck the south to England, the electric supply failed and driving conditions between Oxford and West London became difficult. In the spring of 1993 I showed Human Connections again, this time in the Picture Gallery, Christ Church College, University of Oxford, thanks to the promotion of experimental art of the Curator, Lucy Whittacker. The installation was exhibited with The Official Version, which also used bronze and mixed materials, and a number of smaller bronzes, each of them formed in wax and cast here in our family foundry at Hanborough. Lucy is an art historian, today Assistant Curator of the Royal Painting Collection. She wrote a criticism of the installation in the small booklet we produced for the Christ Church exhibition. This is an extract from her written commentary. Human Connections attracted some attention in London mainly because of the two masks – male and female – (who happened to be me and my wife Sylvie, though my intention was to exhibit two human faces, not to appear, in any way, autobiographical). In Oxford it gained no critical notice so I was both interested and pleased when a Danish woman questioned me about it. Her comment was. I replied that I was only the artist and bronze-caster, it was for others to make such decisions. Despite the kind words of the Danish lady I did not expect that Human Connections would be exhibited again. The bronze plates, the two masks and their cases all went into store, with the exception of a small number of inferior plates that I melted in the furnace. The rest had to stay outside the studio. Twenty years passed before I resurrected Human Connections. By that time I had used up most of the plywood. I had originally treated the galvanised steel that covered the base with nitric acid to produce random corrosion and the exposed steel had almost rusted away. The cement figure and the fence surrounding her fared best. The fence aged in an authentic way and green algae gave the figure a patina. The offer of a fifty year retrospective exhibition by In Flanders Fields Museum was an honour that I did not expect. After so many years, arranging each of the bronze plates on the figure was a puzzle and I had to re-cast some of the plates. The Ieper (Ypres) City Council carpenters made new plinths for the figure and railings and for the two bronze masks. The exhibition opened in the Konigshalle in the Cloth Hall on the 14th of June 2013.